Powermite has been a leading supplier of EKD Kolibri energy chain to the southern African market for more than three decades. The company shares a combined knowledge of over 50 years in drag chain applications with EKD, the globally renowned energy chain manufacturer based in Germany. The exceptionally reliable EKD Kolibri energy chain reduces the need for spares and requires very little maintenance. Additionally, the robust chain can operate long term in extreme temperatures ranging between -20 and 100°C. Powermite’s comprehensive EKD energy chain range includes galvanised steel, stainless steel and carburised (hardened) steel. The company’s energy chain product portfolio also extends to a plastic range consisting of self-extinguishing, ATEX, anti-static, steel-coated and robotic bi-directional chain. 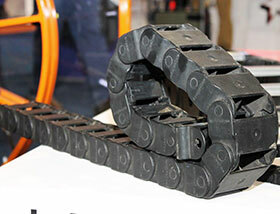 All plastic chains are equipped with integrated connectors, thus requiring very few spare parts. “We also offer chains designed for ultra-long distances. Known as the Marathon System, these chains use roller sets and are capable of maintaining speeds of up to 200m/minute,” adds Lung. Powermite supplies three different types of EKD Kolibri energy chains to the African market, namely the one part link or flap-open link range, a wide range of bending radii which facilitates largest cables, as well as chain with separate end-connectors where each link can be used as an end-connector. Lung explains that the bars of the flap-open range ensure easy access for on-site installation of hoses or cables. The EKD Kolibri series ranges from external sizes of 15 mm x 15 mm through to 65 mm x 225 mm while the EKD PKK range can handle external sizes up to 100 mm x 340 mm. Steel external sizes start from 50 mm high up to 1500 mm wide. Powermite, a division of Hudaco and ISO 9001:2000 certified, was established in the late 60s as a one stop supplier of electrical crane materials and flexible cable reeling drums to the local market. The company has since expanded and is today a market leading supplier of electrical and mechanical equipment and energy supply systems. Products include a comprehensive range of industrial and mining cables, industrial and mining plugs and sockets, cable reeling equipment and accessories as well as energy supply systems such as Downshop lead systems and insulated conductor rails. A countrywide branch and distribution network in Johannesburg, Witbank, Cape Town, Durban, Richards Bay and Rustenburg carries a full range of spares for the entire EKD Kolibri drag chain range, perfectly positioning Powermite to provide after-sales and service support to customers and end-users in approximately fifteen African countries, as well as in Mauritius.